Thus, if then there is no flattening, and the planet is consequently spherical, whereas if then the flattening is complete, and the planet consequently collapses to a disk in the - plane. Table 2.1: Properties of the Maclaurin spheroids. These properties are set out in Table 2.1. 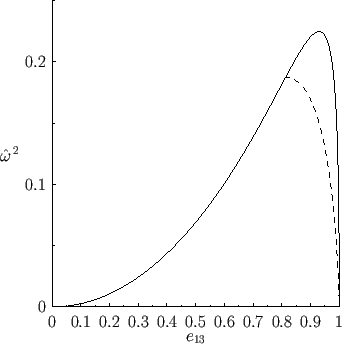 Figure: Normalized angular velocity squared of a Maclaurin spheroid (solid) and a Jacobi ellipsoid (dashed) versus the eccentricity in the - plane. This result was first obtained by Newton. The actual ellipticity of the Earth is about (Yoder 1995), which is substantially smaller than Newton's prediction. The discrepancy is due to the fact that the Earth is strongly inhomogeneous, being much denser at its core than in its outer regions. Figure: Normalized angular momentum of a Maclaurin spheroid (solid) and a Jacobi ellipsoid (dashed) versus the eccentricity in the - plane. Figures 2.5 and 2.6 illustrate the variation of the normalized angular velocity, , and angular momentum, , of a Maclaurin spheroid with its eccentricity, , as predicted by Equations (2.122)-(2.124). It can be seen, from Figure 2.5, that there is a limit to how large the normalized angular velocity of such a spheroid can become. 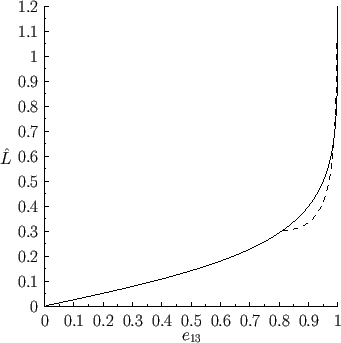 The limiting value corresponds to , and occurs when . For values of lying below there are two possible Maclaurin spheroids, one with an eccentricity less than , and one with an eccentricity greater than . Note, however, from Figure 2.6, that despite the fact that the angular velocity, , of a Maclaurin spheroid varies in a non-monotonic manner with the eccentricity, , the angular momentum, , increases monotonically with , becoming infinite in the limit . It follows that there is no upper limit to the angular momentum of a Maclaurin spheroid.